Eat the Street turns a year old this month, and organizers are celebrating the milestone with a “Luau Food Truck Festival” on Friday, Jan. 27 in Kakaako. The “luau” will feature an array of dishes and Hawaiian-style activities, music, and entertainment. Food trucks expected to participate include Kai’s Pasteles, India Café, Koi 808, Elena’s Restaurant, Extreme Tacos, Ono Pops, Simply Ono, Hawaii’s Fried Musubi, Chimney Cakes, Alonzo’s, Why’s, Grandma G’s Kitchen and Soul Patrol, among others. Music will be mixed by Shogunai’s DJ crew, and there will be a monthly art battle hosted by Lightsleepers. Friday’s “Luau Food Truck Festival” will take place from 4 p.m. to 9 p.m. at 805 Ala Moana Boulevard, mauka of Kakaako Waterfront Park. Admission is free. Organizers suggest the public seek street parking on Ilalo Street and other nearby blocks. 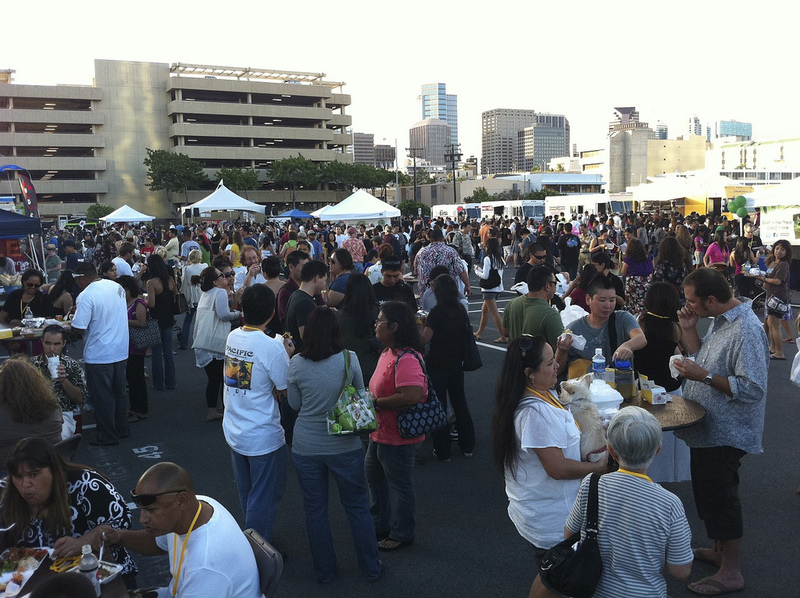 Past events, held most often on the last Friday of every month, have drawn thousands of people and more than 30 food trucks and street vendors in Honolulu. “Eat the Street” is organized by StreetGrindz.com, which host large and small food truck events and assists organizers, businesses and schools in booking events and catering needs. For more information, call 808-780-9288, or connect with StreetGrindz on Twitter at @StreetGrindz or on Facebook. Partners include Kamehameha Schools and Nonstop Honolulu.